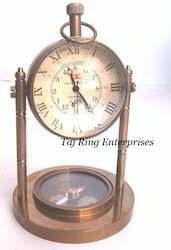 Size:-13cm height & 5cm dia Beautiful moon stand compass with railway regulator dial. Brass moon stand clock, adjustable facility. Body and base, top knob with acrylic decorative.Back covered by direction indicator sticker and both side magnifier glass. Beautiful Polish Finish Paper Weight Standing Clock With its see-through design and Roman Numerals retro style, this clock will make a gorgeous addition to piece or table, but will also be the perfect present for someone else or a treat for yourself!All work is hand madeIts best gift for collectors. It is made of brass, and all work is by hand. We can put this clock in the top of table, and also can use in office home decoration etc. We are engaged in offering our clients, Standing Clocks which are very attractive and fascinating in vibrant colors and ideal dresses. They are skin friendly, non toxic, soft and smooth and have pleasing looks. They are made of high quality materials and conform to international standards in make, quality and design. High quality table top Verticle Rectangle clock in wood with beautiful finish. Customize it just the way you want and take home something really amazing. We are ready to make your desired product of wood. Our table product are very good in quality. All table product are made of wood which is very strong. Clock stand made of pure wood. It is very good in quality. It a handmade clock stand. It decorate the clock. It is a tableware item.